Actifit is a decentralized application built on the steem blockchain. The users who download the app (available for Android and IOS), can share their activity on steem and they get rewarded in cryptocurrency. The Team of Actifit consists of Ambassadors, Professional Athletes, Moderation/Support Team and dedicated Actifitters who are active in an engaged community! Social Media plays a big role in bringing this community together and expanding it. It is a long time that we have not documented our social media followers. 57 days to be more exact. In this post, we will be examining the growth of each social media account. We will be comparing the growth since 15 of January 2019 and will be mentioning some absolute numbers. Our goals are to continue informing, entertaining and engaging actifitters (but not exlusively) and to grow our community so that we can approach potential cooperators, influencers etc more easily and with specific details to share. Let's see some numbers now, shall we? 👑 🐦 The social media champions were Twitter & Instagram with an impressive 56% increase in followers! ♨The second platform with a 19% growth was steem! The steem account @actifit has been daily updating the users since day 1, in June 2018! 🧸 Discord had the smallest increase, however welcoming an average of 2 new members daily is something worth mentioning! Instagram is a very popular platform, where a user can grow using specific actions and strategy. Nevertheless a lot of extra attention and care is needed into not using unethical methods such as followers buying, spamming etc. We posted specific content and hashtags, while searching and engaging with fitness related accounts/brands. 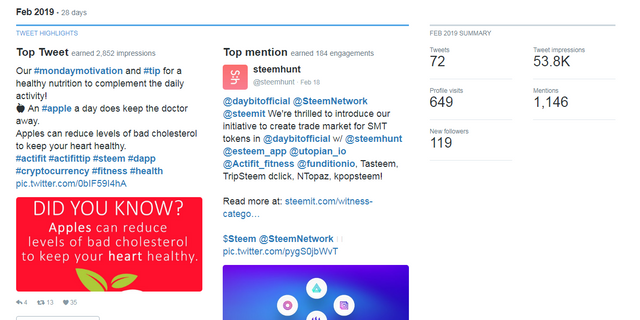 Twitter has been especially active due to a great initiative by @nathanmars (7 push ups daily for 77 days), where users post a video of themselves doing push-ups, using tags #steem, #seven77 and #actifit to be rewarded with STEEM and with AFIT tokens. Let's move on and check out more details per channel! 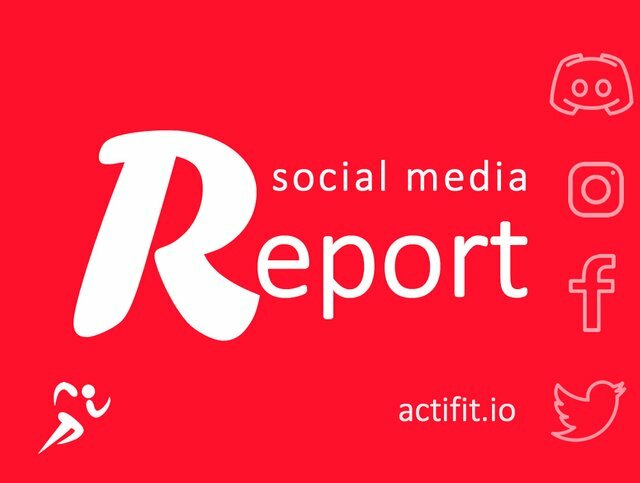 The Actifit is a Business Account, so special insights are available. Our top country is USA, followed by United Kingdom, India and then Russia and more. 56% increase and per day approximately 4 new followers! If you are using Twitter, make sure you turn on the Twitter Analytics. We are havign a blast at twitter! There are so many users that find an incentive of doing push ups an staying active, while being rewarded! We should mention that this started as a great idea by FreeCrypto who is still supporting and participating actively! 53.8K Impression in 28-days February and 119 new followers! Our top tweet was a health/nutrition tip and we do see that it is a necessity to inform our audience about health/fitness tips, they find them very useful and fun! A Facebook page needs a lots of extra attention and ideally also paid promotion, ambassadors etc., so that it can grow. 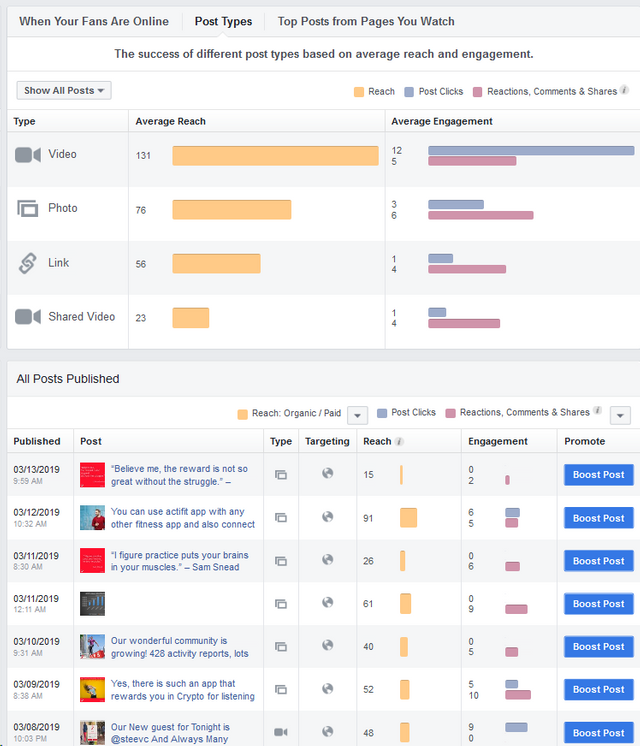 The most popular types of posts are videos (we expected that), which means that we should consider including more videos in our content strategy. Something that is worth to mention is that we answered to support messages in all social media channels. 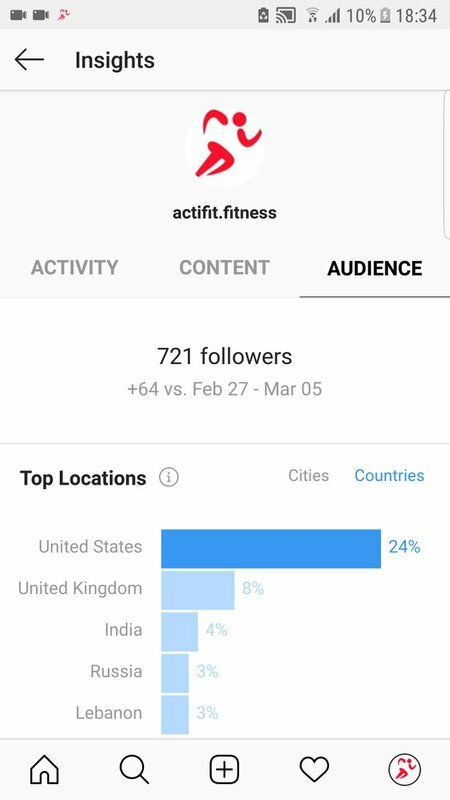 We also replied to people/companies interested to promote actifit, which means that actifit is starting to receive some attention also outside of steem..
As we grow, so do our needs. The time needed to be present and to keep a steady (or even growing) pace increases and so does the fun! As an average, we see 22 new users in all our social media per day - which means an impressive 660 new users every month. There is a lot to be shared here too, so stay tuned! In the meantime, feel free to follow us, stay healthy and most of all, active! Hope you're having a great day. Thank you for another very informative update. It comes as no surprise that the project keeps growing, because you've put together a wonderful team that works tirelessly. Keep up the good work. Once again, your post is detailed, comprehensive and well-illustrated with relevant images. In terms of content, I think that you did a really good job; the post contains valuable information combined with useful metrics. By the way, 660 new users every month is not bad at all! Pretty impressive if you ask me. That said, the post did have issues of style and proofreading, but not to the level where it hurt the reading experience. In conclusion, this is another nice contribution from you, and I look forward to your next one. Γεια σου Κατερίνα, να σου πω για άλλη μία φορά ότι έφτιαξες φανταστικό post!! Your post has been hand-picked by an Actifit moderator for Actifit reward. You've been accordingly rewarded 150 Actifit tokens, as well as an Actifit upvote. Your UA account score is currently 4.585 which ranks you at #1843 across all Steem accounts. Your rank has improved 1 places in the last three days (old rank 1844). In our last Algorithmic Curation Round, consisting of 225 contributions, your post is ranked at #24.